Frank Frederick Borman, II (born 14 March 1928) is a retired NASA astronaut and engineer, best remembered as the Commander of Apollo 8, the first mission to fly around the Moon, making him, along with fellow crew mates Jim Lovell and Bill Anders, the first of only 24 humans to do so. He was also the chief executive officer of Eastern Air Lines from 1975 to 1986. He is a recipient of the Congressional Space Medal of Honor. There was one more impression we wanted to transmit: our feeling of closeness to the Creator of all things. This was Christmas Eve, December 24, 1968, and I handed Jim and Bill their lines from the Holy Scriptures. This must be what God sees. I was absolutely awestruck, not so much at what we had accomplished but at what made the accomplishment possible. A machine produced by more than three hundred thousand Americans was circling the moon with three human beings aboard for the first time in history. 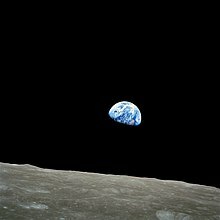 Long before the moon mission, I had told NASA that Apollo 8 would be my last flight. It was a decision reached after a long talk with Susan, although the decision was strictly mine. This page was last edited on 1 September 2018, at 10:37.